Each spring heralds the return of baseball with die-hard fans flocking from near and far to Phoenix-area spring training fields to share a fun afternoon while soaking in some sun. Although 6-4-3 double plays and all-round good hitting is exciting to watch, great pitching is even more admired. Major League pitchers have an arsenal of weapons – the curveball, change-up and slider. But, the most feared pitch is the one every Ace must possess, the fastball. Timed at 90 miles per hour and up, it’s hard to imagine how to see a baseball going at that speed, much less hitting one. But, seasoned hitters miraculously connect with the ball every spring – sometimes sending the ball +400ft out of the stadium. Have you ever wondered how the best hitters see and hit a baseball? This article will take a deeper, scientific dive into overcoming one of the more feared weapons in major league baseball. As the pitcher goes through his pre-pitch routine, he may be gathering information from the catcher’s hand signals as he decides how he will throw the ball the 60-feet, 6-inch distance to the plate. If he decides to throw a fastball, the ball travels to home plate in approximately one-third to one-half of a second, let’s say 500 milliseconds. As a comparison to just how rapidly a fastball travels, it takes about 300 to 400 milliseconds to blink. At home plate, our batter’s brain takes about 100 milliseconds to process the image of the ball after light and image hits the eye to actually see the ball coming toward him. If he decides to swing, it takes 25 milliseconds for the brain to tell the body to move. Then, it takes about 150 milliseconds to swing the bat and make contact with the ball. This leaves our batter with just 125 to 225 milliseconds to assess the direction of the pitched ball and make the decision to swing before acting, or not. Breaking down how a fastball is hit demonstrates just how miraculous it is that anyone hits one. Yet, Ted Williams widely considered the best hitter of all time, hit 521 home runs and had a .344 career batting average, (34 hits for every 100 at bats). Certainly, eyesight makes a difference on how to see a baseball, but just how important is it to Major League (MLB) organizations? The answer is simple and direct – MLB scouts look for players with outstanding eyesight, specifically 20/12 vision when assessing prospects for their teams. It makes sense that the clearer and stronger the eyesight, the better the ball can be seen. Now, let’s examine anticipation by going back to the middle portion of the pitch when the batter has 125 – 225 milliseconds to decide to swing at a fastball. If he decides to swing it’s when the ball is just 25 to 30 feet in front of the plate. 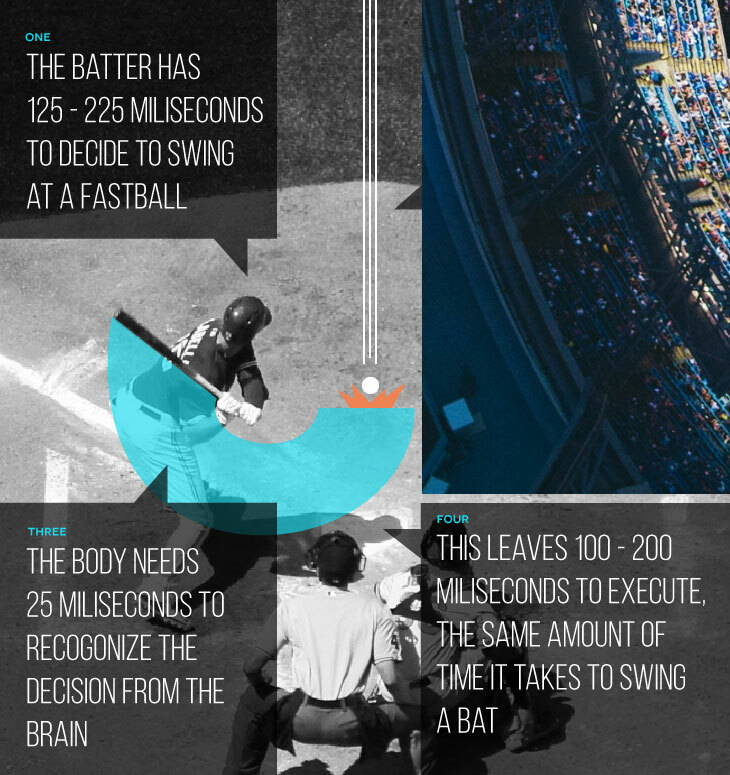 The body needs 25 milliseconds to recognize the decision from the brain – leaving 100 to 200 milliseconds to execute, which is about the length of human reaction time as well as the time it takes to swing a bat. This means an almost instantaneous decision and response. David Epstein, the author of the 2013 best-selling book, The Sports Gene, says that the best hitters are terrific at recognizing the unfolding situation and acting on it. As hitters practice baseball, eye training during live practice helps sharpen their ability to see what is relevant, such as body movements and how to impact the ball as it crosses the plate. How does the Brain Predict Movement? Science agrees with Epstein’s theory. Vision scientists at the University of California, Berkeley, have identified a portion of the brain that tracks the trajectory of moving objects – even if the object is traveling at unbelievably fast speeds. According to the scientists, when the brain recognizes that there is a baseball and tells the body to react, it’s already old information. If the ball is going 100-miles per hour, it travels approximately 3 feet by the time a batter recognizes that there is a ball and 15 feet by the time he decides to swing. So, as the batter is swinging, the body is acting on old information which should make it impossible to hit a moving fastball. The only answer would be that the brain would have to make up for this delay in some way. Lead investigator on the Berkeley study, Gerrit Maus and his research colleagues located and saw the prediction mechanism in the middle temporal region of the visual cortex in the brain as it was computing the trajectory of a moving object. The team used functional Magnetic Resonance Imaging (fMRI) to track visual processing abilities. Now that you know what goes into a fastball and what it takes to hit one, maybe you’ll enjoy the action at the baseball field even more. But, if you want to catch all the action when you’re favorite Ace is squaring off against the opposing team’s power hitter – make sure you don’t blink!